PATENTED TECHNOLOGY – At the heart of each separating element are a special swirler and separator cap developed at Berlin University by a team led by Prof. Dr. Klaus Hartmann, founder of GESIP GmbH. It is patented internationally and manufactured exclusively by KIRK Process Solutions Limited. INLET ZONE – The incoming gas containing liquid droplets and/or solid particles is accelerated at high speed into a cyclonic swirl so that the heavy contaminants are flung to the cyclone tube walls. 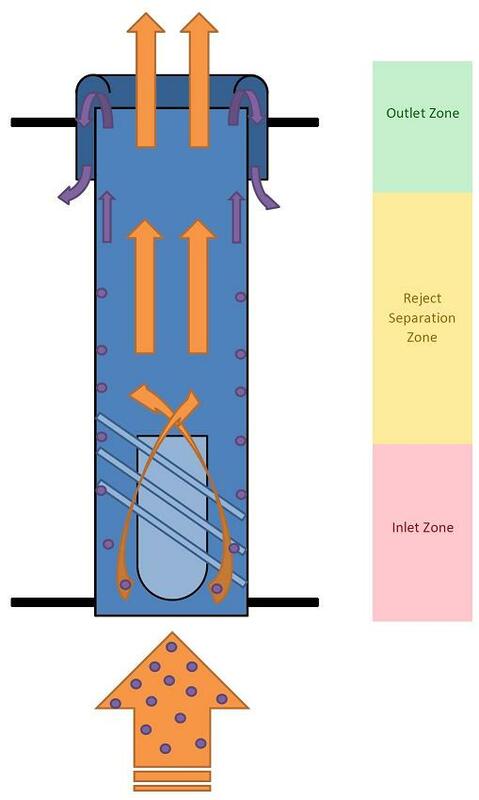 REJECT SEPARATION ZONE – In the main body the contaminants form a film or layer at the tube wall and are swept upwards with the gas due to the combined cyclonic action and longitudinal drag force. OUTLET ZONE – The top of each element is supplied with a centrifugal separator cap which captures the liquid film and sends it falling to the tray deck outside the element tube. Captured liquid drains from the tray deck via a down-comer pipe into the vessel’s liquid sump for disposal. HORIZONTAL INSTALLATIONS – For higher contaminant loadings the cyclones are laid horizontally and the elements are sealed at each end within a free-draining box. A small amount of carrier gas is re-circulated.